Hold a discussion about how and why we remember and commemorate those who fought in past wars. Organise a visit to your local war memorial then research its history including why it was erected, who designed it and what it symbolises. Have students research one of the soldiers commemorated on the memorial (or use the Australian War Memorial website to research a soldier who fought in World War I) then create a presentation to tell his story. Discuss the themes of bravery and heroism. What does it mean to be a ‘hero’ and how do we define heroes in our culture? Brainstorm a list of real life heroes and stories and movies which focus on ideas of heroes, heroism and bravery. Encourage students to share stories of family members who have fought in wars (including those from countries other than Australia). Explore the First World War Discovery Zone of the Australian War Memorial website. Ask students to discuss what it might be like to have been a soldier in the trenches then write a diary entry to describe a typical soldier’s day. Learn about the major battles of the Western Front using the animations on the BBC Schools website. Then read excerpts from the text Zero Hour by Leon Davidson, which provides first-hand accounts of a range of soldiers’ experiences of battles from different perspectives. Discuss some of the tactics involved in the battles, how these affected the soldiers in the trenches and how different soldiers would have had different opinions and attitudes towards these tactics depending on their background and role. Lieutenant Shepard is technically a deserter in the book. Read about then discuss the symbol of the white feather at the First World War website, then read how the British army treated deserters via the History Learning website and article on the BBC History website. Identify and discuss how attitudes towards cowardice and desertion have changed in the last 100 years, and how this might affected the viewpoint of the author when writing the text. Read the Bible story of the birth of Jesus (contained in Luke, chapter 2, verses 1-20 or at BibleGateway). Discuss the fact that the original story does not mention a donkey, however it has been included as part of traditional nativity stories and plays celebrated prior to Christmas. Using a think, pair, share strategy, have students consider the following questions: Why might the author have chosen to focus on a donkey rather than on the birth of Jesus? How does the donkey operate as a metaphor for the qualities of Jesus? The second fable is a traditional tale about the coming of a monsoon, set in India or another similar Southern Asian country. In Australia, the monsoon is often called ‘the wet’. Have students research Aboriginal Australian descriptions of the wet season using the seasonal calendars from the Indigenous Weather Knowledge website (the Miriwoong Seasonal Calendar is another excellent resource and includes a movie) then read about the importance of the Rainbow Serpent on the australia.gov.au website and its association with the coming of the wet in Northern Australia. Discuss the importance of the wet season to traditional peoples around the world, and why they might have developed stories about it. Students might contribute to a Venn diagram to show similarities and differences between the two cultural descriptions. Explore the Australian War Memorial website references to John Simpson Kirkpatrick and Simpson and his donkey then read the picture book Simpson and his Donkey by Mark Greenwood. In groups, then as a class, discuss the ways in which Simpson and his donkey have been commemorated and why the author chose to focus on the donkey rather than on Simpson in the third fable. Read the soldier’s description of going over the top and his experiences with Ernie in no man’s land (pages 103–113). Dramatically re-enact the scene as a series of freeze frames and short action sequences using desks and chairs as props for trenches and obstacles and rolled balls of newspaper as ammunition. Discuss why the soldier acted as he did and what he might have been thinking at the time. Formative: having discussed the context surrounding the text, especially issues such as the handing out of white feathers and contemporary early 20th century attitudes towards WWI, ask students to create a Venn diagram to compare and contrast society’s attitudes towards WWI between 1915 and 2013. They should then write a paragraph to describe how attitudes have changed, and how the text reflects early 20th century attitudes rather than early 21st century attitudes. Summative: brainstorm links to other texts (both written and multimodal) that feature donkeys. Then ask students to either retell or create a new story about a donkey that the soldier might have used to further explain the nature of the human condition, human behaviour or the horrors of war. Students create a variety of sequenced texts for different purposes and audiences. They make presentations and contribute actively to class and group discussions, taking into account other perspectives. Students create detailed texts elaborating on key ideas for a range of purposes and audiences. They make presentations and contribute actively to class and group discussions, using a variety of strategies for effect. On page 57 Lieutenant Shepard observes that people would call him ‘a coward’. Hold a class conscience alley to discuss whether or not he is a coward, taking into account ideas about bravery and cowardice. Selected students might share why they took a particular position. The donkeys in the first three fables operate as a complex extended metaphor for how humans should behave. Identify the message that each donkey’s behaviour reveals and link this to the soldier’s behaviour throughout the story. How is the author using the donkeys as a lens through which to judge, examine and explain the soldier’s actions and behaviour? Examine a series of original Australian and British propaganda posters from the First World War website. Compare and contrast these ideas and images of war with Lieutenant Shepard’s experiences. How did public perception of the war differ from soldiers’ experiences? How does the author allude to these different perceptions in the story? The text combines many different viewpoints for example the narrator, the soldiers, the girls, Pascal, and the inherently integrated viewpoints of 20th and 21st century societies and their attitudes towards war. Assist students to identify these then ask students to write belief statements about how each character/society views a) the soldiers and b) the war. The author used the similar structural device of ‘a story within a story’ for her book The Children of the King, set in World War II. Have students discuss why do they think she used this structural device for both texts? Students recall other books they have read and consider how the use of ‘story’ can help younger readers to explore and explain the complex and confronting themes of war. Students share their ideas. Even though the soldier is not able to see the wild natural beauty of the forest, the author uses it as a point of contrast to the desolate and destroyed ‘No Man’s Land’. Identify the author’s use of imagery to describe these two settings (there are various references to the forest throughout the story, and pages 97–113 describe the trenches and going over the top) and compare and contrast the devices she uses to present one as full of life, and the other as full of death. Pose the following questions to guide class discussion: How is the soldier’s blindness used as a metaphor for his experiences? Why did he go blind in the first place, and what does the renewal of his sight represent? Formative: choose one character from the text and write a diary entry from their perspective which describes the first time they meet Lieutenant Shepard. The entry should include a written description of the soldier as they see him and a short reflection on the fact that he has escaped the war. Summative: write a review of the story, including a brief synopsis of the story, a discussion about how the author has developed and presented the key themes in the text and a rating recommendation judging its literary merit. Students use language features to show how ideas can be extended. They develop and explain a point of view about a text, selecting information, ideas and images from a range of resources. Students create a variety of sequenced texts for different purposes and audiences. They make presentations and contribute actively to class and group discussions, taking into account other perspectives. When writing, they demonstrate understanding of grammar, select specific vocabulary and use accurate spelling and punctuation, editing their work to provide structure and meaning. This text could be classed as a number of different narrative genres: historical fiction, adventure or fable. Provide examples to support each genre and decide which (if any) of the genres is the predominant one. 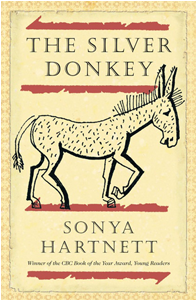 The author has used the good luck charm of a silver donkey as a structural device in the story to both explain relationships between characters and as a conceptual link between the main narrative and the fables. In small groups discuss how and why is this an innovative way to structure a story? Groups share their ideas. Although the story is roughly structured around a chronological sequence of events, the author uses a series of flashbacks, and inserted fables and stories, to structure the narrative. Ask students to develop a way of visually describing this structure (they might want to start with a basic timeline and work from there) then discuss their ideas in order to identify how the author has adapted the traditional plot structure of the narrative. Identify examples of extended noun groups used to describe settings and characters in the text, focusing on the way the author has carefully used vocabulary to build these descriptions. Write down a range of examples from the text and deconstruct them to identify the author’s descriptive techniques and strategies. Identify clauses in key action scenes in the text and find examples of verb and adverb groups and prepositional phrases (adverbials) contained within them. Examine these in order to discover how the author has described the circumstances of these events. How and why does the use of this type of language work to influence the reader and enable them to visualise the setting and events? In order to capture the historical and social context of the story, the author has had to be careful to only use words that would have been used in the early 20th century as well as employing vocabulary that is specific to WWI and the village life the children live. Identify examples of these in order to build a word bank. Using words and phrases from the word bank, students write a letter from a younger sibling to a soldier at the front. Examine how the author uses the soldier as a device to express her own opinions and attitudes about war by locating and deconstructing passages which describe his thoughts and feelings about his wartime experiences. In a few chosen passages, replace some of the negative descriptive words with antonyms in order to build a positive image of the experience of war. How does this activity help to reveal the author’s own opinions and attitudes? Formative: using the text starting ‘In the misty drifting light of dawn’ (page 103) and continuing on to the end of page 105, students should identify at least five descriptive clauses. In each clause they should underline the noun groups in red, the verb groups in green and the circumstances surrounding the event in blue. Summative: imagine the story was not set in World War I but in a recent war (such as Iraq or Afghanistan). Ask students to research and develop a vocabulary bank which they could use to build a descriptive passage of a battle scene. The vocabulary bank should be organised around a desert or mountainous setting and include words and phrases to describe the enemy, weapons and battle tactics. They should then write a paragraph to describe how vocabulary sets a historical, social and cultural context for the story by comparing and contrasting words about WWI with words about a modern war. By the end of Year 5, students explain how text structures assist in understanding the text. They understand how language features, images and vocabulary influence interpretations of characters, settings and events. They analyse and explain literal and implied information from a variety of texts. They describe how events, characters and settings in texts are depicted and explain their own responses to them. By the end of Year 6, students understand how the use of text structures can achieve particular effects. They analyse and explain how language features, images and vocabulary are used by different authors to represent ideas, characters and events. Students compare and analyse information in different texts, explaining literal and implied meaning. They select and use evidence from a text to explain their response to it. The illustrator has used the medium of pen and ink sketching to present images. In the library, find examples of older stories or fables which use a similar technique (think about stories from the 20th century). How does the use of this technique develop a childish and whimsical perspective in the text and why might the illustrator have chosen to draw her images in this way? The images are used to directly illustrate sections of the text and do not tend to provide more information about the story, the characters or the settings. Ask students to compare and contrast the images in this text to one in which the images provide new and additional information about the story. In the comparative text, how do the images need to be read in conjunction with the text in order to develop a deeper, inferred multimodal reading? Why don’t the images in The Silver Donkey lead the reader to develop a deeper multimodal reading? Apart from one scene where the soldier is listening to Ernie’s last request on the battlefield, the illustrator has been careful to only depict ‘safe’, non-confrontational scenes. Examine a series of illustrations and identify the comforting, safe and childish elements incorporated into the images when depicting the characters and settings (look at foreground and background, use of close-ups and far off images and facial expressions). Why do you think the author and illustrator made this choice when developing the illustrations, and how do they develop the overall tone of the story? Note: if students are not already familiar with the metalanguage of visual literacy, these should be introduced in the context of looking at illustrations from the text (Reference: Callow, J. The shape of text to come. PETAA: Newtown, Sydney, 2013). The formative assessment task might be completed as a whole class using the interactive whiteboard. Formative: direct students to look at the image on page 4 of the story which shows the children discovering the soldier for the first time. Students should use visual literacy metalanguage to deconstruct and annotate the image, focusing on how its presentation works to develop a whimsical, safe and friendly tone in the story. After deconstruction they should write a paragraph about the image, explaining why the illustrator might have chosen to present the soldier and the girls in this manner and not in a more frightening or confronting way. Summative: develop an illustration to accompany the chapter titled ‘The Front’ which provides the reader with a new insight into the soldier’s experiences. Think about how the illustration might add additional meaning to the text rather than simply illustrating a section of it. Think about how your choice of medium and colour will affect the mood of the image, and the viewer’s interpretation of it. Students engage with a variety of texts for enjoyment. They listen to, read, view, interpret and evaluate spoken, written and multimodal texts in which the primary purpose isaesthetic, as well as texts designed to inform and persuade. These include various types of media texts including newspapers, film and digital texts, junior and early adolescent novels, poetry, non-fiction, and dramatic performances. Duration This unit represents approximately six to eight hours of classroom teaching. The book could be read during shared and modelled reading sessions or during guided reading sessions. SOPHIE HONEYBOURNE is an Assistant Principal and freelance education writer. She is a passionate advocate for the use of quality children’s literature in the classroom. She has authored units of work to support the teaching of literature in the classroom through PETAA’s Exploring the CBCA Shortlist, and digitally resourced the new Australian Curriculum: English through the production of integrated literature units at the Year 7 Primary level. She has written a monthly teaching guide for the NSW School Magazine. Sophie has delivered professional learning sessions at school, local, state and national levels to further support teachers in the development of quality literacy teaching and has taught pre-service teachers at the University of Sydney.